Our collection consists of poems by Sam, poems by me, and some completely collaborative work, too. These pieces examine lemons, bike marathons, heteronormative society, failure, soap operas, Ikea bags, and that most universal of experiences—sneezing. Ultimately, the chapbook is a celebration of queer friendship—between two young poets (and cuties mhm). Thanks to editor Anthony Frame for believing in this collaboration and for all the labor that goes into this beautiful chapbook series. 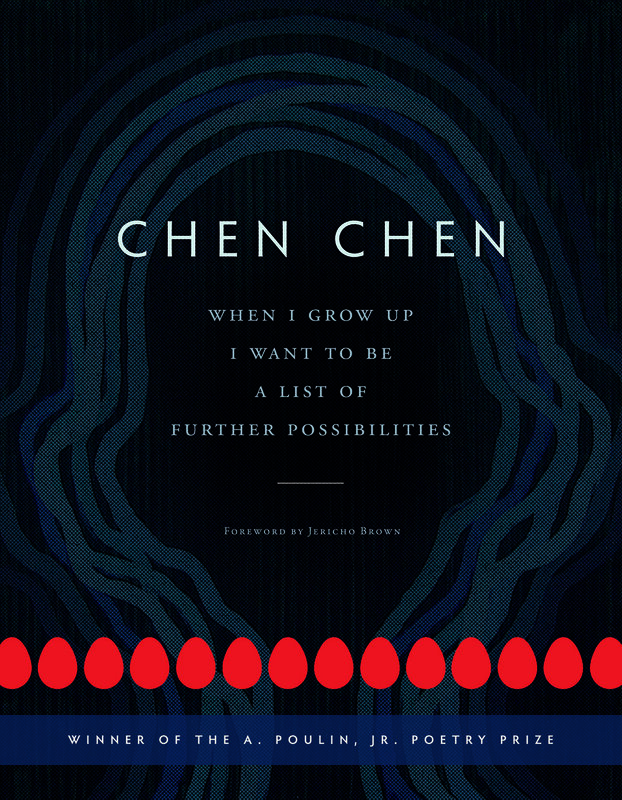 Thanks to Poetry In Voice for including my poem “When I Grow Up I Want to Be a List of Further Possibilities” (yes, the title poem from my book!) in an online anthology of poems available for their recitation contest—and for making this one their poem of the week. Read it on their site. Image, with the original announcement, from Poetry In Voice’s Twitter. According to their website, Poetry In Voice / Les voix de la poésie is a “charitable organization that encourages Canadian students to fall in love with poetry through reading, recitation, and writing.” Honored and delighted to have my poem included and featured this way. So much gratitude to Beth Reynolds for this Olympia typewriter (and thank you also for the oatmeal chocolate cookies!). What a stunning gift. I’ve been wanting a typewriter for a while—when I was younger, my family had one that I loved using, and then at some point, years ago, we just moved on entirely to computers. I’ve been missing the sound of typewriters. The keys and little hammers, the bell. The unabashed clack, this bold machinery. The second image here is my second attempt at typing something on the Olympia. First attempt had many more mistakes, haha. On this page are all my collections—chapbook and full-length, published and forthcoming and still in the works. Thanks to Jeff for looking up how to type the number 1 (not with an uppercase “I” but with a lowercase “L”), how to make an exclamation point (a three-step process), and how to backspace (just a key I keep forgetting is the key). Learning and learning. From the fumbling and the slow attending, trying again. Also excited to use some whiteout! Next—will (must) type up poems/poem excerpts I love. Maybe something by Brigit Pegeen Kelly, whose book Song I just taught in my poetry workshop at Brandeis. And then maybe something by Nikky Finney, whose book Head Off & Split I am about to teach. These will likely be excerpts, as they both tend (gorgeously) toward the long poem. But then, I anticipate, I know that there will also be delight as well as instruction in spending that time—taking that care to type up and out a long unfolding. Thanks to the Smith College Poetry Center for making these beautifully designed cards with my poems on them! I had an amazing time reading at Smith last Tuesday. Many thanks to Matt Donovan, Director of the Poetry Center, for organizing and shepherding and conversing. Thanks to Nathan McClain for the gorgeous introduction at the reading. And my love to former teachers who came to the event—Floyd Cheung (I took an Asian American literature class with him and now he’s teaching my book in one such class!) and Martín Espada (I took a workshop, a Pablo Neruda class, and a poetry of the political imagination class with him at UMass Amherst). It was also wonderful to meet up with some friends, old & new (love how easy it is to visit Western Mass/the Valley now that I’m back in the Boston area). And to explore the Smith College Museum of Art, which has such a fantastic collection… AND an incredible gift shop. For example: this snail figurine!! What a giddy, beautiful day. So this morning I visited my high school, Newton North, to read poems for its annual Asian Culture Day. Wonderful to see some of my amazing English teachers! And to talk with students there now! And then to see this news announced. I'm the writer that I am because of all the brilliant teachers (!) and classmates (!) I've had. Just overjoyed to share that I've received a Literature Fellowship from the National Endowment for the Arts. This grant will go toward many poetry-related things as well as life things, including the finishing (*fingers crossed*) of my second book. And what incredible company here: Reginald Dwayne Betts, Malachi Black, Jennifer S. Cheng, Tiana Clark, Geffrey Davis, Kendra DeColo, Sarah Gambito, Roy Guzmán, Jenny Johnson, Ilya Kaminsky, Adrian Matejka, Kiki Petrosino, Sasha Pimentel, Erika L. Sánchez, Charif Shanahan, Emily Skaja, and others. Love and congratulations to all the fellows. Thank you to the NEA, Amy Stolls, Katy Day, and the judges. Thank you to Sam Herschel Wein, Ashley Mag Gabbert, Jess Smith, Keegan Lester (happy bday! ), Muriel Leung, and Monica Sok--your friendship & feedback & fashion choices have been/are essential. And thank you again to my dissertation committee, Curtis Bauer, Leslie Jill Patterson, and Michael Borshuk, for your insights into so many of the new poems and for your big-hearted support. Jeff: you're not on Facebook, but you know. You know! *heart emoji* I would also like to thank my dog. Thanks, Mr. Giles! (Bff!) Sam Herschel Wein and I wrote a sneeze-&-tissue-filled collab/joint chapbook called Gesundheit! and now it’s a finalist for the Glass Poetry Chapbook Series (which has published/keeps publishing such beautiful, urgent work). Alongside so many poem people we admire! Sunlight & gratitude to editor Anthony Frame. In any case, celebrating this milestone and celebrating all these finalists. Image from this Twitter post/official announcement. 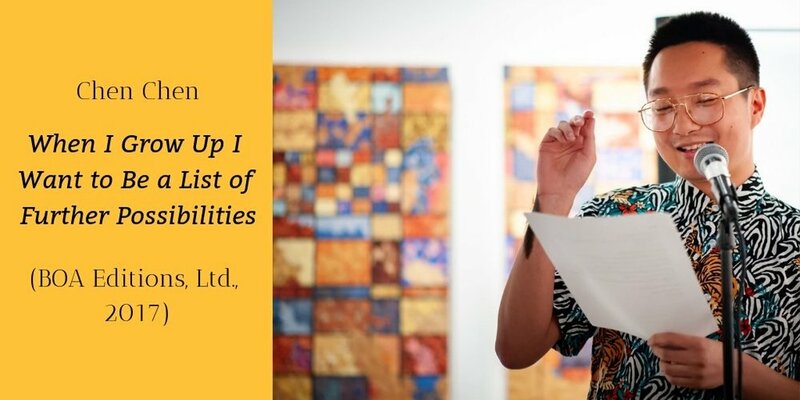 Gratitude to Project VOICE for creating and posting on IG this writing prompt that uses my poem “When I Grow Up I Want to Be a List of Further Possibilities” (yes, the title poem from my book!) as a jumping off point. I so appreciate here the focus on listing and celebrating, on engaging with/subverting expectations, both internal and external. My thanks to Otto Vock of the Project VOICE team for asking to feature my poem. Check out the full post on IG here. I love love poems—reading them, writing them (or trying to). I love the falling in love with language that happens with every poem (or so I hope for). I love the bold effort, the tender effort to say, to sing, and to listen more precisely and strangely. I love love poems for partners, friends, plants, waters, family, your own breath. Kundiman (which itself refers to a genre of Filipino love song)—”First Light,” which was published in Cutthroat: A Journal of the Arts and then in my first book and also in Poem-a-Day. Poetry Magazine on Twitter— “Winter,” which appeared in the Asian American poets issue. Poets.org on Instagram—”The School of Night & Hyphens,” which was published in Poem-a-Day. I’m not supposed to post any screenshots or links to the poem, but I think you have enough info to google it (or find it on this site! ), if you so desire. I think this one’s also been one of my most shared poems online, which has been really moving to see, as this is a deeply personal piece about coming out and coming out again and again and again and. I’m glad the poem is reaching people who need it, and living a full life. Thanks to Catherine Pierce for the shout-out (to my Twitter!—a recent thread on happy poems) in this candid, moving piece, “On Mary Oliver and Resisting Poems of Gladness,” over on The Millions. I, too, have been reflecting on my past reluctance to openly celebrate Oliver’s work, to recommend her poems to students, or especially to colleagues. I regret not speaking more often about what Oliver’s work means to me, while she was still alive. I’m determined, now, not to shy away from my enthusiasm, her gorgeous contribution. Read Pierce’s entire essay here. I’m so honored and excited to be judging the poetry category of Fugue’s 2019 writing contest. Submit for a chance to win $1000 and publication in the journal. Submissions open until April 15th. More details and the submission portal here. Finally picked up my physical copy of Brandeis Magazine—in which I’m featured, as the new Poet-in-Residence! Thanks to Heather Salerno for interviewing me. And to Mike Lovett for taking this very professorial portrait. You can read the article online here. 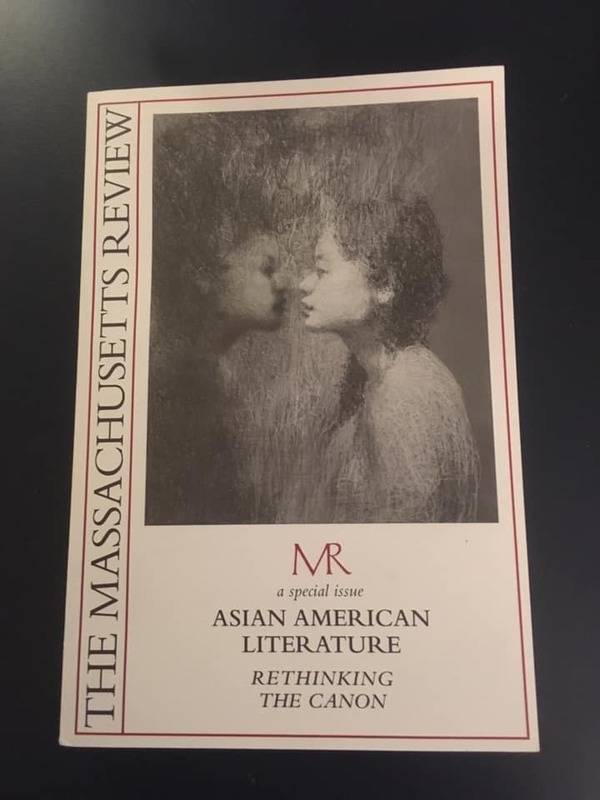 Ahh I’ve got 2 very queer, very season-obsessed poems in the new Massachusetts Review, which is an issue devoted to Asian American literature. Here’s one poem, “Spring.” You can read the other one, “Winter,” over on my Instagram. With many thanks to the guest editors, Cathy J. Schlund-Vials and Lawrence-Minh Bùi Davis. And what an amazing feature of this issue, the lectures and addresses—Asian American writers talking about, thinking about other Asian American writers. This publication also marks a personal milestone: my third time in the Massachusetts Review! Having grown up in Amherst, then Boston, this journal has long been on my radar—was one of my first dream pubs. So glad, as an Asian American who most strongly feels “from” Massachusetts, that my third contribution to the journal is for this issue. At the same time, my continued reading and working in Asian American studies lead me to question “belonging” to any state under rubrics of “American-ness” (too often dependent on proximity to cishet whiteness). Also considering who has yet to appear in this and other “Asian American issues” of journals—and how I can help shift things, with such issues and beyond this framework of the special issue and “inclusion.” Grateful to the writers in this issue for reminding me to keep pushing my imagination, my politics, my craft. It’s been a stressful, difficult week, and to learn of Mary Oliver’s passing is so crushing. Hers were among the first poetry books I found as a high schooler, wandering the local library, starting to seek out poems on my own. Out of need. Today, I need these words of hers again. Gratitude to Twenty Stories LA—LA’s mobile bookstore (now with a “brick and mortar” location in Pawtucket, RI)—for including my book in their January 2019 edition of twenty curated titles. What a beautiful way to encourage new readership, more book loving. See the full Instagram post here. Thanks to librarian Gwen Glazer for including my book in "How to Read Harder in 2019," a recommended reading list for the New York Public Library. Great to be on here alongside poetry books by Nicole Sealey, (BOA pressmate!) Marcelo Hernandez Castillo, and Tracy K. Smith. Check out all the recommended books, across twenty-four categories! Slightly belated but still super enthused thanks to Anthony Frame, Editor of Glass Poetry, for including my poem “I Invite My Parents to a Dinner Party” (originally published in the Poem-a-Day series) in his 2018 year’s end list of recommended reading. 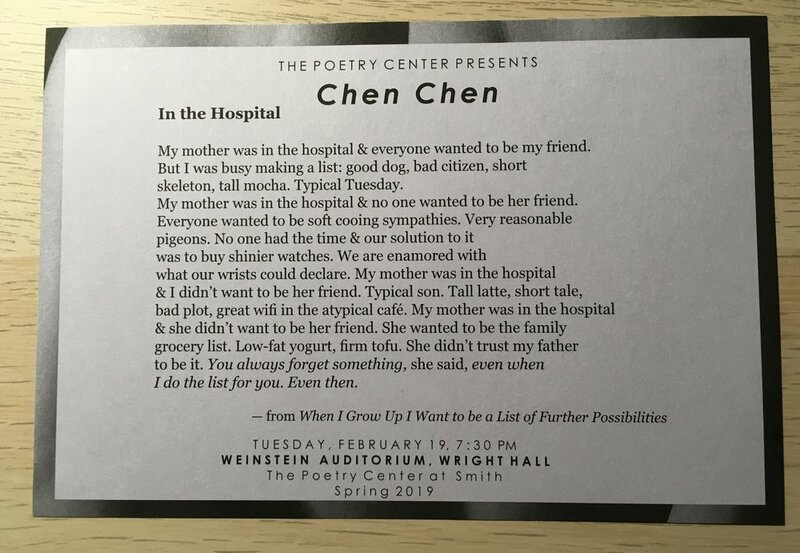 What a blessing to find my work here, alongside stunning poems by Gabrielle Calvocoressi, Kristin Chang, Yujane Chen, Cassandra de Alba, Logan February, Roy Guzmán, Luther Hughes, Sara Eliza Johnson, Rachel McKibbins, H. Melt, Noor Ibn Najam, Julian Randall, Leah Silvieus, Erin Elizabeth Smith, Shelley Wong, and others.